Hated by the child who was her son... and forbidden to say "I am your mother." 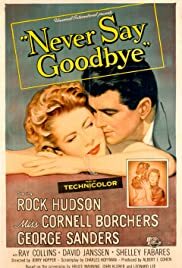 Although widely acknowledged that parts of "Never Say Goodbye" were directed by Douglas Sirk, the credit is given to Jerry Hopper with no mention of Sirk at all. Filmographies of Sirk's work most often do not include this work. "Never Say Goodbye" has many of the hallmarks of Sirk's work, though is much lacking in the biting social criticism that elevated his finest work. Like "Interlude" this is pure melodrama, filmed with style but ultimately forgettable. Rock Hudson and George Sanders turn in predictably solid performances but it is Cornell Borchers an Ingrid Bergman Greta Garbo hybrid, who manages to bring a sense of truth to the more than unlikely drama, which is essential for the melodrama's success. While obviously not in the class of the major Sirk melodrama's there is enough here of interest to followers of his work.